Kindest wishes for your welfare. Ida B. Herman was born Jan 1862 in California. From the 1880 census to the 1910 census she lived with her family in Sutter Creek, California. In the 1920 census she is located in Honey Lake, Lassen County, California. She is listed as a Teacher to a private family. 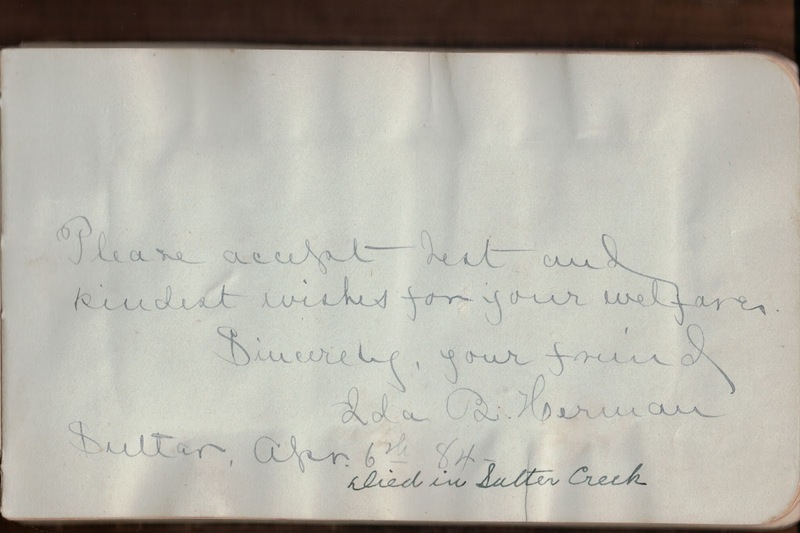 By the time the 1930 census is taken, Ida is back in Sutter Creek and still listed as a teacher. She owns her own home. It appears that Ida never married. She died 5 July 1938, in Amador County, California. Ida was buried with her family in the Odd Fellows Cemetery, Sutter Creek, California. roll #84; citing Family History Library (FHL) film no. 1,240,084.
roll #112; citing Family History Library (FHL) film no. 2,339,847. “California Death Index, 1905-1939,” database, Ancestry.com (www.ancestry.com : accessed 2 Sep 2015), entry for Ida B. Herman, 5 Jul 1938, Amador County; citing original death records, California Department of Health Services, Center for Health Statistics, Sacramento. Find A Grave, Inc., Find A Grave, database (http://www.findagrave.com : accessed 2 Sep 2015), entry for Ida B. Herman (1862-1938), Memorial No. 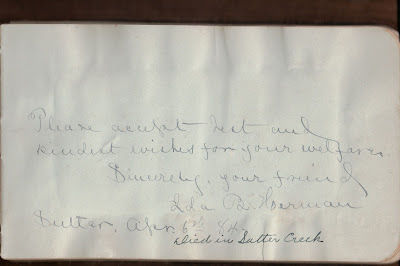 79683265, Records of the Odd Fellows Cemetery, Sutter Creek, California; page created by Caralee Bromme, 1 Nov 2011.